We have just introduced the Crowbank Availability Calendar, a new feature on our website. The calendar shows detailed picture of our availability in the Kennels (Standard as well as Deluxe) and Cattery. To make things simple, we classified dates into three categories, green, amber and red. Good Availability – we have several runs available. Please note that at times, runs can fill up quickly, and so you should make your bookings as soon as possible. Limited Availability – we only have very few runs available. Please contact us before finalizing your plans. No Availability – we have no runs available for the date. You might want to make a standby booking, and we will let you know if a run becomes available. Note that we have separate availability for morning and afternoons. For example, if we have availability for the afternoon, but not the morning of your arrival, we may only be able to take the booking for an afternoon arrival. Similarly, we might only be able to take a booking for a morning check-out if there is no availability in the afternoon. For each date, the top-left half represents the morning, while the bottom-right represents the afternoon. 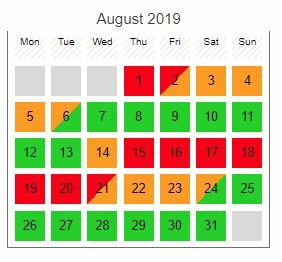 For example, in the calendar on the left, we have no availability on the morning of the 21st, but may be able to accommodate an arrival on the afternoon of that date. This is a new feature for us. Please be patient as we work out all the bugs! Fiona and Eran Yehudai own and run Crowbank Kennels and Cattery. Find out more about us here!